Santa Clara County supervisors Joe Simitian and Cindy Chavez. Undocumented immigrants facing threats of deportation by the forthcoming Trump administration may soon have more legal help in Santa Clara County, according to county officials. At the Dec. 6 meeting of the Board of Supervisors, Board President Dave Cortese and Supervisor Cindy Chavez will promote a plan to expand legal services for undocumented residents needing representation for hearings or help preparing documents. 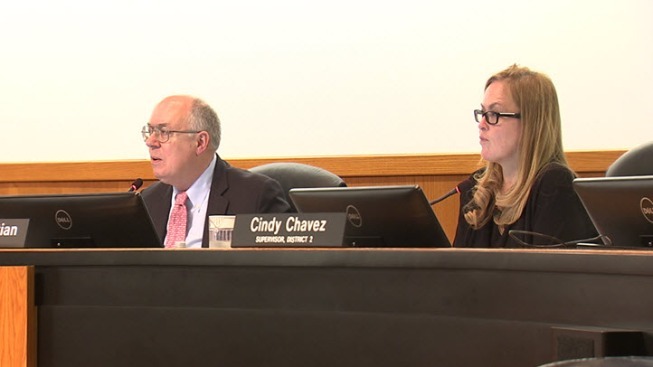 The plan would also ensure that immigrants in the county are informed about changes in federal immigration policies that may affect them, according to Chavez and Cortese. "We will do everything we can to make sure our residents know their rights and have access to legal services to protect them from unjust deportation," Cortese said in a statement. "The county has long strived to be a place where immigrants can live without fear of being uprooted from their homes. That doesn't go away with a new administration in Washington," Cortese said. Over 37 percent of Santa Clara County residents were born outside of the U.S., according to U.S. Census data. The plan would involve a partnership between nonprofits, the county's Office of Immigrant Relations and San Jose's Office of Immigrant Affairs, according to Chavez and Cortese. The meeting will convene at 9 a.m. in the Board Chambers of the County Government Center, at 70 West Hedding St. in San Jose. The meeting's agenda will be posted on the county website on Nov. 30. "We must ensure that families are not broken apart without due process - and that means making sure that they have legal representation," Chavez said in a statement.